New York City Mayor Bill de Blasio promised illegal immigrants living in New York City that they need not fear Donald Trump's deportation plans. He plans to resist President Trump's immigration policies at all costs, whatever that means. Now, Chicago Mayor Rahm Emanuel is echoing De Blasio's declaration. Speaking at a press conference at the Lurie Children's Hospital on Monday, Emanuel said Chicago will "always be a sanctuary city." 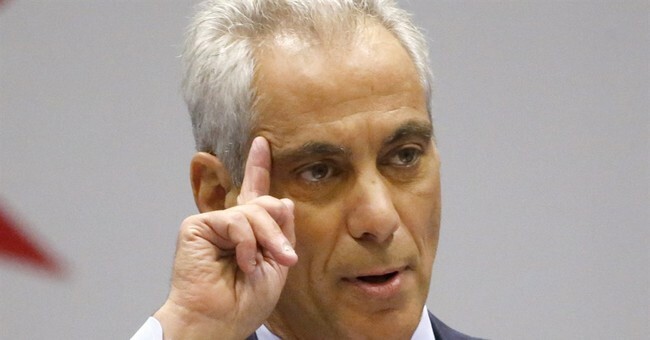 "To all those who are, after Tuesday's election, very nervous and filled with anxiety as we've spoken to, you are safe in Chicago, you are secure in Chicago and you are supported in Chicago," the mayor said. He's not kidding. Under sanctuary city status, police don't have to report illegal immigrants to U.S. Customs and Immigration Enforcement. "Sanctuary city" became a deadly term last summer after a young lady named Kate Steinle was gunned down and killed by an illegal immigrant in San Francisco. After that tragedy, members in Congress introduced "Kate's Law" to mandate at least a five-year prison sentence on illegal immigrants who return after being deported and pledged to defund any cities who choose to harbor illegal non-citizens.